Saturday, June 17th, 2017 – Due to several setbacks (including no track vehicle), we missed the first two weekends of our usual race season. However, thanks to Brian Galletta and his Jeep, we can FINALLY get the season started. Saturday evening was the goal instead of our usual Sunday (for Father’s Day & avoiding possible showers), and TWO features were in store to make up for the two week delay. The Arnie #93 driven by owner Josh Arnold passed Mike Patak (who later went on for a WILD flip) to win the 1st Feature, while in the 2nd feature, Matt Stevens stormed into the front and never looked back in the Galletta’s Greenhouse/Chrusher.com Frankenfreak #74! Video is up: Race Page & Complete YouTube Race Videos Here | Higher Resolution Victory Lane picture here. Saturday, June 24th, 2017 – We took another preemptive Saturday race (to avoid forecasted rain on Sunday) and held another twin-feature night to get caught up for missing the 1st two weekends of our usual season (1st weekend in June through at least September). And lo-and-behold, the polar opposite of last year’s start has occurred–where Kelly Miller, Matt Stevens and Chris Stevens hogged all the wins in the 1st EIGHT features–we have four features and FOUR different winners! Kevin Galletta outlasted early leader Adam Lytle (who broke down while leading) to win the 1st one, and Keith Raymond outlasted Chris Stevens and Matt Stevens (each of whom ALSO broke down while leading) for the win, although Josh Arnold gave him a great run. (And Kevin had to take his kids home before the start of the 2nd feature, so he is represented here by his Force Ghost.) More details and FULL race video (including BOTH Tower camera AND Matt helmet camera in full HD) below: Race Page & Complete YouTube Race Videos Here | Higher Resolution Victory Lane picture here. 7/3/2017 – Independence Day Makeup Points Race! Monday, July 3rd, 2017 – Between the season opener being postponed 2 weeks, along with almost all of our regular drivers missing out on both Sunday (postponed) and Monday evening races, it was a somewhat chilling warning of our season not having enough drivers,a problem we have raley had in our 22 year history. However, with excellent veteran racer Kelly Miller being available and bringing two drivers (son Stephen and nephew Griffin), along with a 1st timer rookie racer also joining in, we were able to have a makeup points race. A 35 lap “retcon points” makeup race! You can read more about it and watch the YouTube video here. Saturday, July 8th, 2017 – Although we usually run Summer Sundays at Galletta’s, this season Saturday has been working better for a majority of our drivers. And a rather competitive trend has been happening this season: The 1st SIX feature races have had SIX different winners! In the 1st 30-lapper, Adam Lytle FINALLY broke his streak of breaking down to win DOMINATE the 1st one, pulling away from Chris Stevens and the rest of the pack to lead all 30 laps without even a challenge. In the 2nd 30-lapper, Chris Stevens also led all 30 laps, but was challenged by Kevin Galletta, Lytle, Matt Stevens and Josh Arnold. And Josh has been fast all year, scoring excellent finishes on top of his feature win earlier this season! Chris got a big choking hug from his daughter Faith for the win (and some victory laps on daddy’s lap). More details and FULL race video (including BOTH Tower camera AND Matt helmet camera in full HD) below: Race Page & Complete YouTube Race Videos Here | Higher Resolution Victory Lane picture here. Sunday, July 16th, 2017 – Keith Raymond became the 1st 2-feature winner this season as he passed a loose-but-fast rookie Nicholas Cassano and held off a few other competitors for his 2nd win in 3 features this season (last week he was delayed and showed up after the races were done and everyone had gone home! Yikes!). Good, clean racing on a nice track, as the track workhorse “OgreMobile” is back in action and the track can be graded and rolled for the 1st time since the opener! The racing has been VERY close this year — very few passes along with very few walk-away wins and with 6 winners in 7 features this season thus far. Race Page & Complete YouTube Race Videos Here. 8/5/2017 – Twin-30s won by Kevin Galletta & Matt Stevens! Saturday, August 5th, 2017 – In Tim Galletta’s 2-weekend return for the 1st time in 4 years, Kevin Galletta led every lap of the 1st 30-Lapper to take his 2nd feature win of 2017. Matt Stevens then led zero laps and just stole Lee Gleason’s 1st victory away from him by sneaking the front bumper past the stripe on the final lap of the night. The funny thing was Lee’s kart has had terrible motor sputtering issues and lack of power for a while now, and Matt put around a week of work testing and fixing the motor until it got up to par. And if not for Matt’s craftiness on the final lap, Lee would have put the #29 (the former Thunder Island/Larry Phillips/Kenny Lindsley III/Eric Woolworth/Billy Ruggio/Eric Woolworth/Keith Raymond/David Hall/Lee Gleason ride) in victory lane for the 1st time in a long time. Full race YouTube Video, results and points are here. 8/26 – 8/27/2017 – WILD crash during 17-Kart Doubleheader: Saturday Night 40-Lapper AND Sunday Night 35-Lapper for a Double Show Weekend; Josh Arnold and Matt Stevens Victorious! SUNDAY, AUGUST 20th, 2017: A Galletta’s Greenhouse Backyard Speedway Points race requires at least seven drivers to count for points, and due to only four veteran drivers available, it is not enough and the races for this weekend have been cancelled. R&C Sushi Bar LLC’s surprise 50/50 prize for the winner & points fund has also been cancelled due to low driver turnout and the fact that everyone who shows up apparently is too poor to enter a 50/50 contest. SATURDAY, AUGUST 26th, 2017 – SUNDAY, AUGUST 27th, 2017: Several drivers (a few that raced with us before a couple of years ago) enabled us to get a show in and it wound up a good one. There was also a nasty wreck late in the feature with bodies flying. Then, the next day, several MORE drivers (this time a handful of rookie 1st time racers at Galletta’s and a surprising return of Team Dann) joined us for a surprise Sunday evening showdown. As you can see from the video, the racing was actually extremely good both Saturday AND Sunday considering the amount of new drivers in both! Read more & view YouTube video here! Wacky Driver Attendance Note: Now while we have 30 different drivers who have raced this season from June through August, NINETEEN have only raced in ***ONE*** event, ONLY NINE have raced more than twice, and ONLY FOUR have raced in every race this season, and one of those four just races one lap for points and pull off. Seriously? Nobody wants to race anymore? What is going on? Are people that dirt poor or that empty-sacked?! C’mon people. Let’s race! Sunday, September 3rd, 2017 – Due to lack of available drivers (only 5-6, and just short of our 7 driver minimum field), Labor Day week festivities, two races last weekend, Oswego Speedway’s Classic 200 delayed due to rain and work (we’ve raced after the 200 many times), our annual Labor Day Saturday to be held on September 2nd, 2017’s race was postponed. Go figure… as last weekend we had SEVENTEEN DRIVERS racing on TWO NIGHTS thanks to two batches of newbie drivers last Saturday and Sunday… and this weekend, we could only get a hold of 5 or 6. Next weekend, we project a bigger driver count, as long as some of last weekend’s new drivers come back. (Reading this guys? Let’s make another big field! Out track and club history is littered with dozens of examples where hundreds of drivers quit just as it’s getting good. If they didn’t quit when they did, we would be having 23 kart fields instead of 5-10 kart fields. Simply because 4-5 drivers quit as soon as another 4-5 other drivers joined). See you next weekend! Saturday, September 9th, 2017 – Due to lack of available drivers (only 4-5, far short of our 7 driver minimum field), our races are again cancelled for the week. Once again, we are only open to Friday or Saturday races from Labor Day on, so if you want to race, contact us. (Due to work, family, school, and football, we will not be able to race any more Sundays.). However, if more racers don’t start coming soon, we will be forced to schedule our 200-Lapper with only a few drivers and be done with the season. SATURDAY, September 16th, 2017 – We finally had enough drivers on board to get a show in (THANKFULLY!! ), and again it was thanks to a small group of new guys joining the action and doing a very impressive job with only little experience in our karts and track! And it wound up being a very good and entertaining race! (Now if only we could get some more veteran drivers back from self-imposed and excuse-filled hiatuses, to make the racing be even greater!) Chris Stevens emerged victorious in his GallettasGreenhouse.com/Chrusher.com/OswegoSushi.com #4 after inheriting both 2nd place from Josh Arnold (who trapped Chris in traffic to take 2nd before he broke down) and taking the lead from Lee Gleason (after he got extremely loose in turn 1). But rookie Robert Swan challenged Chris on the last lap (somewhat surprising him), showing great progress in limited track time! Click for the race page. More… NOTES: Of 33 drivers, only 3 raced in every race (and a 4th took around 1 lap and exited and still got 4th in points), and all but 8 raced more than once or twice. Sadly, Matt spends many hour weekly keeps 20+ karts prepared and Chris does a complete website dating back 22 years with 12 years of complete race videos (both to ZERO pay for their efforts)… and nobody can come up to have fun racing? Saturday, September 23rd, 2017 – Saturday, October 7th, 2017 –Matt had originally loosely scheduled the Klassic 200 for Saturday, September 23rd, then firmly for 30th, then sternly for October 7th and then….. WELL, WELL, WELL… FOR THE 9TH TIME IN 18 WEEKENDS SINCE OUR JUNE OPENER… WE DON’T HAVE ENOUGH DRIVERS YET AGAIN! WOW! SURPRISE. HALF OF THE RACE SEASON HAS BEEN CANCELLED?! Why? Not weather! Nope. Not karts! No, plenty of those. Nope,… NO DRIVERS! And people got mad when I said everybody quit? Sure looks like it. Well, here we go, we gonna’ try again and see! The 22nd Annual Galletta’s Klassic 200 is now scheduled for Friday, October 13th, 2017. If we have to race with only Josh, Chris and Matt and that’s it, so be it, as they have been the only 3 showing any skill and determination at racing at all every single race all season. 10/13/2017 – THE 22ND ANNUAL GALLETTA’S GO-KART 200-LAP KLASSIC! Saturday, September 23rd, 2017: 22nd Annual Klassic 200 Race Postponed Due to Lack of Driver Availability. Saturday, September 30th, 2017: 22nd Annual Klassic 200 Race Postponed Due to Lack of Driver Availability. Saturday, October 7th, 2017: 22nd Annual KLASSIC CHAMPIONSHIP 200-LAPPER Race Postponed Due to Lack of Driver Availability. Friday, October 13th, 2017: 22nd Annual KLASSIC CHAMPIONSHIP 200-LAPPER . . . . .
WE DID IT! WE GOT ENOUGH DRIVERS! IT FINALLY HAPPENED!!! 10/13/2017 – The 22nd Annual Galletta’s Greenhouse Karting Klassic 200! 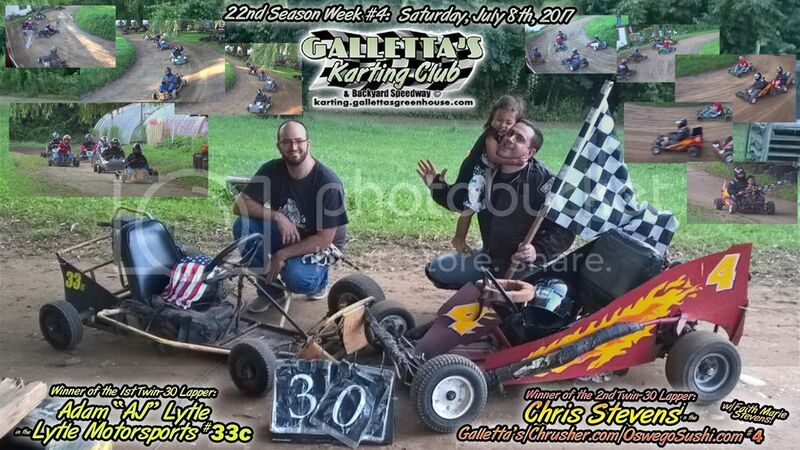 Friday, October 13th, 2017 – Our 22nd Annual Galletta’s Go-Karts 200-Lap Klassic Championship FINALLY went down after a near month of delays due to lousy driver attendance, occasional bad weather, colds, and other strange anomolies. We actually had to schedule it on an unusual Friday evening due to all the delays, otherwise risk weather not cooperating and losing more drivers than we already had a difficult time mustering. And it wound up being one of the best and most climatic races in Klassic history, which is what we hope for all of them. Race page is currently under construction done, so enjoy this unedited video playlist, updating points and victory lane photo! Key: ® = Newbie / Rookie to our races (less than a season of races on our track) * = Makeup Feature Used (heat race for bonus points to earn towards a feature missed earlier in the season) T = Mid-Race Timeout Used (One allowed per newbie, three allowed per regular driver per season, additional ones earned via 100% attendance and/or regular feature wins) k = Mid-Race Kart Change Used (includes a point penalty per change). Fun (or sad?) facts about 2017 Season: – Only 5 of 34 drivers attended at least HALF of the season’s races (a 14 year low). – Only 4 of 34 drivers raced in every event (a 14 year low). – 21 of 34 drivers were rookies (Either 1st time drivers or drivers with less than one season of races [on the Galletta’s track], another a 14 year record). – Half of the regular season events were cancelled due to not enough drivers in attendance on race day (A 22 year high). – Klassic was postponed three weeks due to not enough drivers committing (a 15 year record). – A handful of drivers did not pay, but a few of them negotiated deals with Matt. Paying entry/kart rental doesn’t always mean money for gas + part-wear. Sometimes it includes chipping in with track/kart work, donating karts or kart parts and/or gas for the karts or track work, and/or bringing paying drivers to race and fill seats when we are low on drivers. The track and karts run on nominal BARE BONES donations and if drivers don’t pay their fair share, Matt will try and cover it, but property owner Mary Stevens covers it if he cannot (which happens every year because the donations NEVER cover costs, especially when nobody shows and/or some show and don’t pay). Maybe some people think it’s fun and games to break karts and burn gas and Matt doesn’t deserve the money, and if you fell that way then try running a track and 15-20 karts for friends/family on your own dime and get back to us, thanks. Drivers all-time stats at two of Oswego, New York’s Dirt Karting Tracks — Our own Galletta’s Greenhouse Backyard Karting Speedway (est. 1995; counted from 2000-2017) in green, and the Oswego Kartway’s 1-WD Gas Division (formerly known as Oswego Speedway Dirt Track, also calls itself “The BULLring”, est. 2006; counted from 2006-2008) in orange. Key: Bold = Active in last season; ® = Rookie (less than 10 races on track).